working on people’s pleasure boats in the Caribbean Islands is a great gig. Howey writes fast. 4000 words in a day is no big deal. He wrote to order. 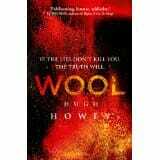 When fans started saying they wanted to hear more about the Silo in Wool, he wrote more for them. He had no idea that this short story would take off, but he knew a good thing when he saw it, and he seized the day. Trust your own judgment. He had already turned down one publishing contract to self-publish. Later, he had to turn down several agents until one talked about bigger issues than the 15% cut they had hoped to receive. Value your fans. I already knew this one, because I can’t help myself. I love my fans. It awes me when people read my work, and it totally stuns me when they contact me to tell me they loved my novel, or better yet, write a positive review. Howey also explained the work he and others did to determine author earnings, which showed that there are people making a living from their self-published writing even if they’re not million selling outliers like him. His concluding advice to writers is write what you enjoy, don’t wait for miracles, just keep writing, and dare to hope that you’ll be surprised one day.